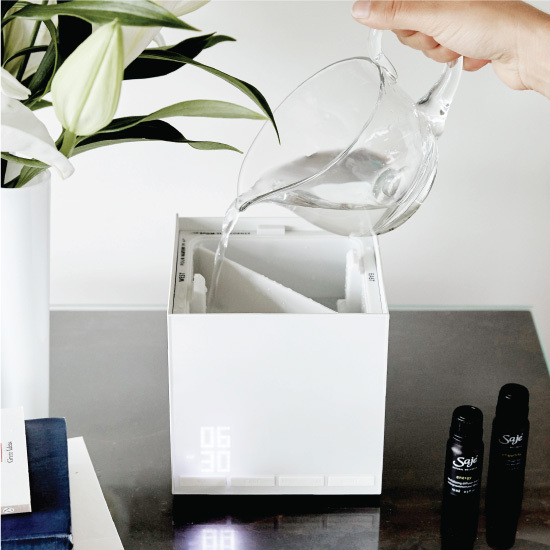 Two tanks and a timer you can pre-set to start automatically morning and night means you can have wellness around the clock. Inspired by the body’s natural rhythms, fill the East tank with an energizing blend to rise, and the West tank with a relaxing blend for rest. Fill the East and West tanks with unfiltered, room temperature water to the maximum water level lines. Then, to set your digital clock, press the H (hour) button until you reach the correct hour. Press the M (minute) button until you reach the correct minute. Once you have chosen your preferred time, wait five seconds to allow the clock to set. 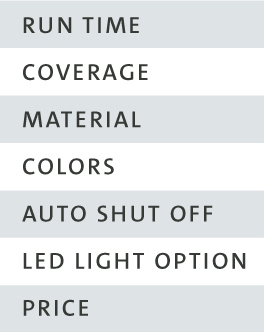 #SajeTip: The LED light display can be turned off. Just press the Light button once to turn it off and again to turn if back on. Add 10-15 drops of your favorite uplifting diffuser blend to the East tank. Add 10-15 drops of your favorite calming diffuser blend to the West tank. #SajeTip: For your East tank, we recommend Energy Revitalizing Diffuser Blend to help you rise and for your West tank, we recommend Tranquility Relaxing Diffuser Blend to help you rest. To set your East and West tank timers, hold down the East button until the clock flashes. Set the hour (H) and minute (M) you wish to rise. Press the East button to confirm selected mist time or wait five seconds, allowing the time to set on its own. Repeat steps for the West tank. #SajeTip: For the East tank, we recommend setting your timer one hour before you rise, and for the West tank, we recommend setting your timer one hour before bed. Wake up to wellness and drift off to a restful night’s sleep with the healing power of plants. #SajeTip: Block out light and get into sleep mode with the Shut Eye Soothing Herbal Eyeshade. This diffuser works really well for us and we love the two tanks!!! Lavender for bedtime and allergy release in the morning. 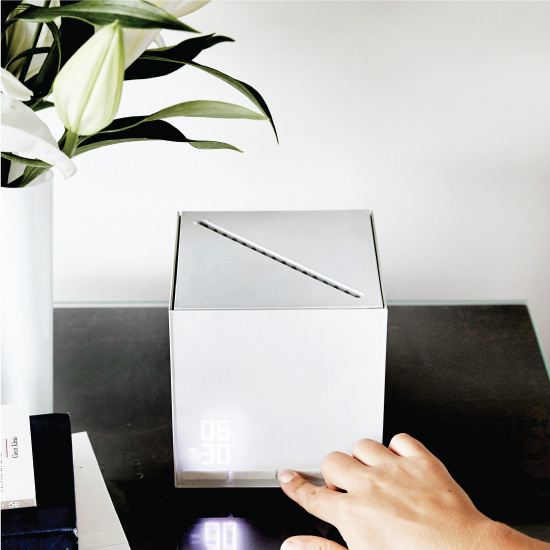 The timer is the best feature for this diffuser as we can set allergy release before we even wake up. I do wish the light can be dimmed though, I agree with other reviewers that it's too bright. Otherwise, very happy with our purchase. Worth the money! I love this diffuser. It leaves the whole room smelling great and I have noticed a difference in the air quality. My favorite part is the two tanks with the timers. It is perfect for diffusing a relaxing blend while going to sleep and setting a timer for an energizing blend to wake up to. 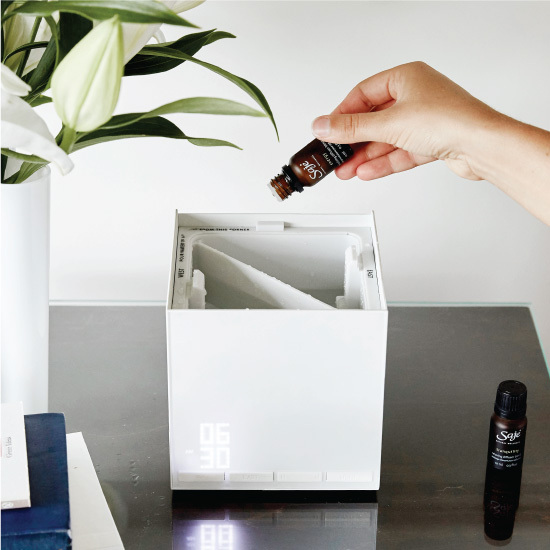 Ever since using this diffuser I have had signifcantly more restful sleep and been waking up less groggy in the morning. It also has a great run time. I'll start the diffuser right before I leave for work and when I return it is still running and my room smells great. The air is no linger stale after I have been gone all day. I just moved in with two friends who have been avid users of diffusers for some time. And, I should add, both are passionate promoters of Saje and it's products. Through them I've come to really appreciate the benefits of aromatherapy and so I took it upon myself to by my first diffuser. This product is amazing. It's a stylish work of art and besides that, it works miracles in my life every day. I don't know how I got along without it. I love the two tanks. It's great to not have to wash it set it all up again for the evening. The timer function is also awesome and so simple to use. I've gotten rid of my beside alarm clock, and just use this now. It's perfect! Thank you Saje.